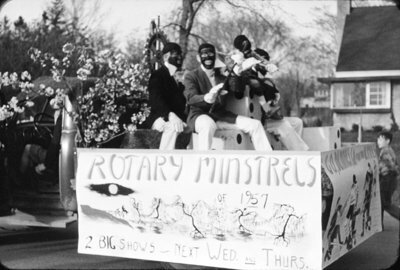 Black and white negative showing the Rotary Minstrels in blackface during the Whitby Dunlops Allan Cup parade. The Whitby Rotary Minstrels are sitting on the float which is proceeding on Henry Street. Whitby Dunlops Allan Cup Parade, 1957, Charles Mesher, Whitby Archives, 21-007-227.